Vroom, vroom! Beep, Beep! It's that time of year again! Join us for the 20th Annual Big Truck Day and Children’s Festival on Saturday May 19th, 2018 from 9:45-2:00! 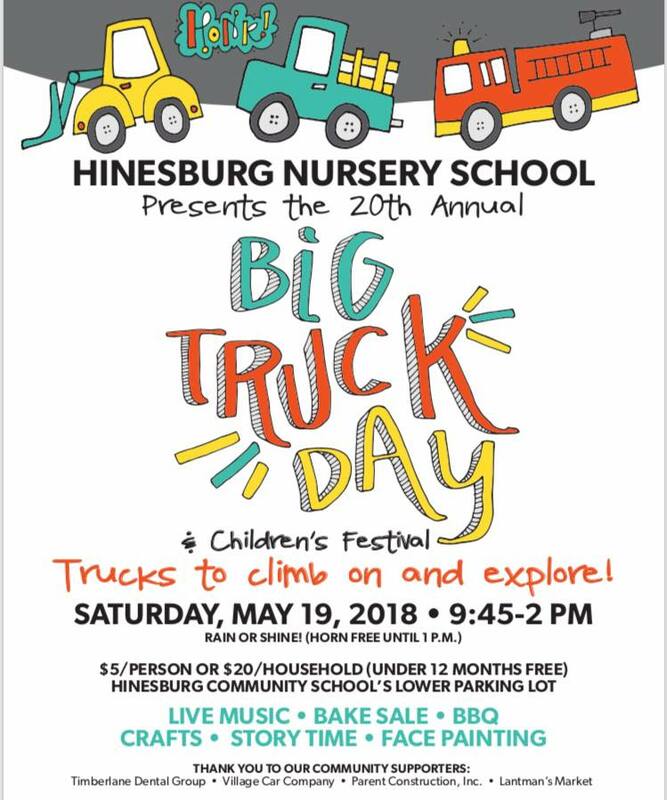 Vehicles of all kinds will roll into town for the Hinesburg Nursery School's Annual Big Truck Day and Children's Festival. Big Truck Day is a community event that lets youngsters and their families get up close to (and even climb inside!) their favorite big trucks and vehicles. The action all takes place behind Hinesburg Community School. This year the lot will be packed with construction vehicles, a school bus, firetrucks and other rescue vehicles, tractors and utility vehicles for children of all ages to see, touch and explore. After the kids are done investigating the big trucks, they can enjoy entertainment by Mike & The Big Blue Trunk, face painting by Snow Queen, live music, a visit from Monty the Moose from The University of Vermont Children's Hospital, Home Depot Kids Workshop and much more! Everyone can fill up on tasty BBQ lunch and goodies from the bake sale. So bring your camera, your appetite and your friends for a day full of fun! Have sensitive ears? Don't worry--the event will be horn free from 9:45 until 1 p.m. Proceeds from the event benefit the Hinesburg Nursery School, a nonprofit, STARS certified, state licensed parent-cooperative preschool for children ages 3 through 5.